If you enjoyed Susan’s Zucchini-Key Lime Cobbler recipe, you might really enjoy reading her book. Making It Home: How to Run Your Household Like a Business . . . and Find Your Heart Along the Way by Susan R. Blaske Williams is a clearly written book that covers the basics of running a home from the perspective of an older mom. (Susan’s a mother of four and grandma of three). Covering topics from disciplining kids to minding your finances, she wrote the book at the request of her daughters-in-law, who wanted her to put down on paper the homemaking principles that have worked for her. Susan includes the compelling story of her own journey, starting as an overwhelmed young mom who ran from her role as wife and mom by immersing herself in the work world. What young mom can’t identify with Susan’s struggle? Running a home and raising a family is hard work, and few of us have any idea of what it takes until we find ourselves dazed and confused, doing a job we can’t remember ever applying for. 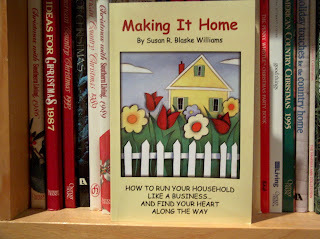 I’m giving away a copy of Making It Home, kindly provided by Susan herself. If you’d like to win, leave a comment. (If you really, really want to win, leave two.) I’ll randomly pick a name next Friday, August 28, by 7 p.m. Pacific time. Good luck! To visit Susan at Making It Home Magazine: Encouragement for Women with a Heart for Home, go here. I like that she writes from an "older" perspective. Sounds like a great read! this sounds like it would be a really interesting read! Good Morning, This books look sso ineteresting-even if I do not win I may order one! Please enter me in! I'm a Susan! I need this book! For while there are many things I do well, running my home and being disciplined about it is not an innate gift of mine. I would love the book! SOunds perfect. Oh, I would LOVE LOVE LOVE this book! Sounds fabulous and exactly what I need right now. I'm in!! Oh my gosh....i just found your site from RuthAnn's site and WOOHOO! I would LOVE to win this book! It sounds WONDERFUL!!! Back to leave another comment. It's for the CHILDREN, Lynn, the CHILDREN. That book sounds like a goldmine! I'd love to be entered in the drawing. This sounds like the perfect book for me right now. They act like they know it all already, and I don't have a clue. I'd be interested in how she does this. This sounds like a book I NEED! I'm going to be a stay-home mom soon, so I could REALLY use this book! I mean, I could REALLY use this book! As a mom of 4 kids, ages 8 and under, I could really use this book. I might wait and make a second comment b/c I think I really really could use this book!! I'd been debating with myself about entering, wondering whether it was more for "new" housewives. But even though I've been at it 30 years, there is still plenty I don't know. And if I can always pass it along to my new daughter-in-law.